National Institute of Epidemiology (NIE) is going to conduct Walk in Interview for the roles of Project Technician-III, Field Officers post. You can get or Download Application through Official website. Want to know more details? now check below all details. Graduation details are : 12th pass in science subjects and two years diploma in medical Laboratory (or) One Year DMLT + one year of laboratory experience in a recognized organization. National Institute of Epidemiology. 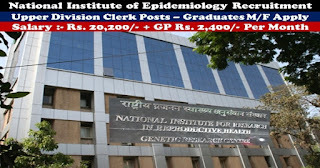 The National Institute of Epidemiology (NIE) was established on July 2, 1999 by merging the Central JALMA Institute for Leprosy (CJIL Field Unit), Avadi with the Institute for Research in Medical Statistics (IRMS), Chennai. Salary range of details are: Rs. 18000/- per month. Educational Qualification : 10th pass or equivalent with certificate course in Auxiliary Nurse Midwife (ANM) in Government recognized institute/board. Procedure of In interview or Procedure : Candidates will be selected based on Interview.